OUR COLLECTIVE NERVOUS BREAKDOWN – I defy anyone to prove to me that we, as a nation, are not going through a collective nervous breakdown right now. I mean we’ve got bad news after bad news just seemingly piling up everyday on television or in the newspapers. Don’t get me wrong – we’ve been through this before with the civil rights movement, the Vietnam War, and yes, even the Watergate scandal. And after each one, for better or for worse, our nation has come out a bit different than before the experience. But what we’re going through right now is definitely, and literally, shaking us to our core. There can be little doubt that all of us are still recovering (if you want to call it that) from the tumultuous 2016 presidential election, and the highly unlikely emergence of Donald Trump as the Republican nominee. The fact that such a crass, greedy pig of a man would even be seriously considered by a major party for the highest office in the world still sends chills down my spine. And yet, controversy after controversy failed to derail this heathen from the race. To add insult to injury, while the Republican Party found itself literally being manhandled by the Trump force, the Democratic Party was being divided by a definitive split caused by the candidacy of outsider and insurgent Sen. Bernie Sanders challenging party standardbearer Hillary Clinton. Yes, Hillary had plenty of baggage, and lots she had to answer for, the least of which was explaining her private email server in her home for official business while serving as secretary of State. And then, of course, big money she accepted as speaking fees from well-heeled Wall Street interests. So both major political parties were having hear attacks, and the nation was faced with some difficult, scandal-a-day choices leading right into the November 2016 elections, where the shock really came – Trump won! To say that everyone with any sense was speechless, is an understatement. It seemed certain that Hillary had the election sewn up…until the results began coming in, and she stalled. All of a sudden, we were all left with figuring out just how bad a Trump presidency could possibly be, based on what we knew of his past history of both personal and professional disasters. When January 20th, 2017, we immediately found out, as Trump gave a red meat inauguration speech, sending a clear message that the days of solid, reasoned leadership by outgoing Pres. Barack Obama were definitely over. There were court fights over Trump’s Muslim-ban; stunning revelations that Russia had tried to influence the US presidential elections, with growing evidence that it was in concert with the Trump campaign; the firing of FBI Director James Comey and resulting controversy of allegations that Trump was attempting to shut down the FBI investigation into his campaign; accused former Pres. Obama of illegally wiretapping him before he was elected; hiring a paid agent for a foreign government to be his national security advisor, only to fire him for lying to Vice President Pence….and the list of Trump outrages continued into this week with a frightening war of words with North Korea, the fatal tragedy in Charlottesville, Trump rhetorically patting white supremacists on the back as “fine people,” and the list goes on and on. And now we have a monster hurricane which has devastated parts of Texas, and North Korea has indeed fired a missile that has landed in the sea of Japan. It seems as if we’re all at each other’s throats, and that things are getting worse, not better. More importantly, there seems to be no moral leadership we can point to. Even leaders of the church seem to be in our crooked president’s back pocket. Yes, we are having a collective nervous breakdown, and it seems to be getting worse every day. And yet, we’ve been here before, and we’ve come out of it stronger and wiser. We can only hope and pray to GOD that that is exactly what will happen after this trying experience. The only question left is …when? Republican legislative leaders insist that they redrawn fair maps per the federal court’s directive, making sure that race has played no part in their construction. Thus, both the state House and Senate Republican majorities have approved their maps with few changes, over the objections of Democrats, and citizens statewide who pleaded for a nonpartisan process. maintains that is “just lying” that the court eliminated the use of race in redrawing the districts. The federal court clearly ruled that race could not be the predominate factor. Those maps will be submitted to the three-judge panel on Friday, Sept. 1st for judicial review. If approved, those redrawn districts (28 of 170 were ruled to have been illegal racial gerrymanders when drawn per the 2011 redistricting plan), will be in effect for the 2018 midterm elections. Democrats, on the other hand, counter that the process was anything but fair; highly partisan, and the newly redrawn maps will be seen as equally inadequate as before. Rep. Pricey Harrison (D- Guilford) shared the frustration. “…[T]he proposed plans do not offer an adequate remedy and do not represent appropriate remedies free from other constitutional flaws, including racial gerrymandering and grossly unconstitutional partisan gerrymandering, “Rep. Harrison said. The proposed maps also violate the state constitution’s Whole County Provision. In addition, the proposed Wake and Mecklenberg maps violate the state constitution’s prohibition on mid-decade redistricting. I believe the maps will be challenged and may have a hard time passing muster with the federal court. I do not know if that will affect the 2018 elections, but we will be spending more taxpayer money defending the indefensible. Republican Rep. Donny Lambeth said he wasn’t sure whether the new maps will be a done deal with the federal court, but feels the court’s directions were properly followed. State Sen. Joyce Krawlec (R-Forsyth) also believes the redistricting process was fair. But state Sen. Gladys Robinson (D-Guilford) clearly has little faith in the new GOP-drawn maps, and feels that the federal court may have to be the final arbiter. Robinson’s Guilford County colleague, Rep. Amos Quick III, also a Democrat, agreed. Amen to that, agrees Rep. Evelyn Terry. Rep. Cecil Brockman (D-Guilford) concurred. US Fourth Circuit Judge James A. Wynn, Jr.
Count today as a landmark in North Carolina history. For the first time ever, all past and present African-American justices of the North Carolina Supreme Court are being honored for their invaluable contributions to the state’s judicial history during a special celebration at the Law and Justice Building in Raleigh. The event is part of the upcoming recognition of the 200th anniversary of the NC Supreme Court. Justice Beasley continued, “As former and current members of the high court, Judge James A. Wynn, Jr., Congressman G.K. Butterfield, Justice Patricia Timmons-Goodson, Justice Michael R. Morgan and I are beneficiaries of the noble course Chief Justice Frye charted. In times like these when the state and the nation wrestle with issues often marred by racial tension, we must be mindful that it is important for the makeup of the courts to be reflective of the diverse makeup of the state's people." Indeed, in the 200 years of the NC Supreme Court, there have only been six African-American members to sit on the high bench. Chief Justice Henry Frye was the first. Frye retired from the practice of law in 2016. A native of Ellerbe in Richmond County and an alumnus of NC A&T University, Frye decided to become an attorney when he was denied the right to vote after being confronted with a “literacy test” as a young man fresh out of the military. He graduated UNC School of Law, later becoming one of the first blacks to be appointed as a federal prosecutor in the South. It was 1968 when Frye was first elected to the NC House, and 1980 when he became a state senator. In 1983, he was appointed to the NC Supreme Court, and 16 years later, Justice Frye was appointed the first African-American to become chief justice. He served in that capacity for two years. “You do the best you can because you want to set an example for others,” Chief Justice Frye once said. US Fourth Circuit Court of Appeals Judge James A. Wynn, Jr. was appointed to the federal bench in 2010 by then Pres. Barack Obama. But years before, Judge Wynn briefly served on the NC Supreme Court from September 28th to November 3, 1998, after which he returned to the NC Court of Appeals from 1999 to 2010. The Robersonville native holds degrees from UNC-CH, Marquette University Law, and the University of Virginia School of Law. Afterwards, Wynn served in the US Navy’s Judge Advocate General Corps as a JAG officer, and later a military judge. 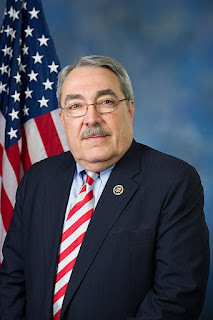 Wynn later practice law in Greenville, and was appointed to the NC Appellate Court in 1990 before briefly serving on the NC Supreme Court, and then returning to the state appellate court before being confirmed for the federal appellate bench. Congressman G. K. Butterfield (D-12-NC) was first elected in 2004, after serving a brief stint on the NC Supreme Court from 2001 to 2002. He returned to the Superior Court before being elected to Congress two years later. The Wilson native earned his law degree from North Carolina Central University School of Law in 1974, and years later, was elected a Resident Superior Court judge, presiding over criminal and civil cases in 46 counties. In a telephone interview Tuesday, Butterfield said today’s celebration really began with his suggestion that the six veteran justices just come together and take a picture. The next thing he knew, it evolved into a major ceremony. 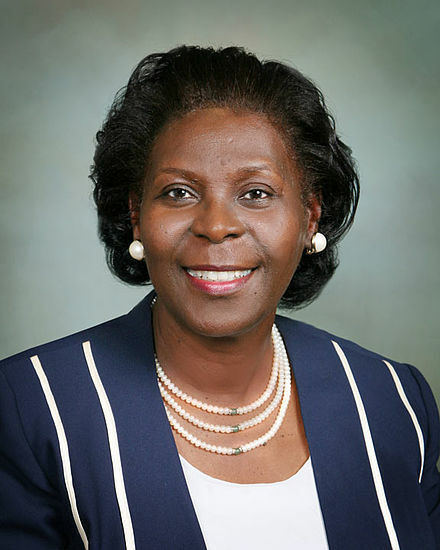 The first black woman ever to serve on the NC Supreme Court was Patricia Timmons – Goodson, from February 2006 to December 2012. The Florence, South Carolina native earned her law degree from UNC-CH School of Law in 1979, and Master of Laws degree from Duke University School of Law in 2014. In the early 1980s, Timmons – Goodson served as a prosecutor in Fayetteville, and then a staff attorney for the Lumbee River Legal Services. In 1984, she became a District Court judge, serving four terms. 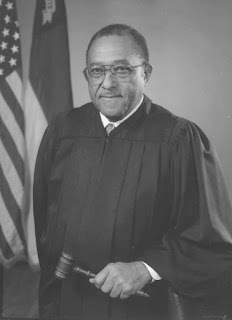 In 1997, Judge Timmons-Goodson was appointed to the NC Court of Appeals, retiring in 2005. In 2006, then Gov. 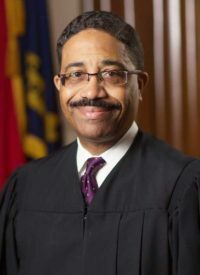 Mike Easley appointed Timmons-Goodson to the NC Supreme Court to take the place of the retiring Justice Sarah Parker, becoming the first black woman to ever serve. She was elected to continue on the high court in November 2006, stepping down in December 2012 so that then Gov. Beverly Perdue could appoint state Court of Appeals Judge Cheri Beasley to the seat. Justice Timmons-Goodson was the appointed to the US Commission on Civil Rights by Pres. Barack Obama in 2014. Before being appointed to the NC Supreme Court, Judge Beasley was elected to the state Court of Appeals in 2008, becoming the first African-American woman to win a statewide office without being appointed first. She won a full eight-year term to the Supreme Court in 2014. 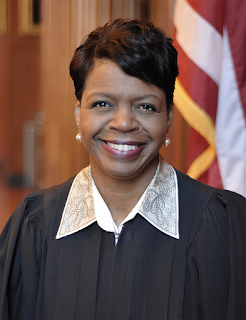 An alumna of Rutgers University and the University of Tennessee College of Law, Beasley was appointed as a Cumberland County District Court judge in 1999. She elected twice again until her appointment to the Court of Appeals. Finally, Justice Mike Morgan had been a judge for over 26 years before being elected to the state Supreme Court. He served five years as a NC Administrative Law judge; ten years as a District Court judge; and had also served as a Superior Court judge since 2005. Morgan is an alumnus of Duke University, having earned his law degree from North Carolina Central University School of Law. 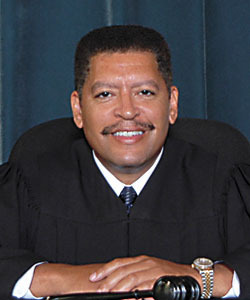 Associate Justice Mike Morgan was the last African-American to join the state’s high court, having been elected in November 2016. He is ever mindful of the important judicial lineage he maintains. "This salute to those of us who have been fortunate to serve on the Supreme Court of North Carolina is a tremendous, fulfilling experience,” the New Bern native said. “I'm humbled to be associated with this strong legacy of African-American justices on our state's highest court and to be recognized with my judicial colleagues in this wonderful way. I am a great admirer of all of them and am thrilled to share this celebration of our service with them." Justice Morgan is also mindful of the important contributions made by African-Americans to the state’s judicial system. “The richness of diversity which African-Americans have brought to the court system of North Carolina as judges has contributed mightily to the pursuit of justice. We've served on all levels of the state's court system, decided the most challenging of cases, and have done so with proven ability and with steadfast commitment to the preservation of the rule of law." Winston-Salem attorney Eric Ellison says having these six servants of justice on the highest bench in the state has everlasting meaning. Irving Joyner, professor of law at NC Central University’s School of Law, says the fine tradition of blacks serving on the NC Supreme Court is being keenly upheld. [RALEIGH] The NC NAACP has announced that its 74th Annual Convention will be held in At the Raleigh Convention Center on the weekend of Oct. 5-7th. The theme for this year’s convention is “Forward Together, Not One Step Back: For Justice We NEVER Sound Retreat.” This will also be Bishop Dr. William Barber’s last state convention as president, which he has served as for the past 12 years. New officers for the civil rights organization will be elected at this time. [RALEIGH] Despite the fact that the US Supreme Court isn’t due to hear a Wisconsin case on the constitutionality on partisan redistricting until next year, a three-judge federal panel in Raleigh ruled this week that challenges to North Carolina’s 2016 congressional maps can proceed to trial before then. The panel rejected Republican arguments that the case should wait until the Wisconsin case is decided. The North Carolina trial, originally scheduled for next summer, was postponed awaiting this court’s decision. [DURHAM] In a unanimous 7-0 vote Monday, the Durham School Board decided to ban all symbols of the confederate flag, Ku Klux Klan or Nazis from its dress code on school campuses. The board also voted to strip the name of white supremacist Julian Carr from the middle school building at the Durham School of the Arts. Carr, a former confederate soldier, bragged at the dedication of the Silent Sam statute on the campus of UNC at Chapel Hill of how he beat a black woman so bad, her arms were ripped to shreds.